Lowdown: The timid alien has to rescue his flashy and heroic brother from Earth. Did you, like me, have enough of computer animated movies for kids, especially those released just on time for school holidays? Did you, like me, find yourself heading to the cinema still with your child, because one has to do something during school holidays? If that is the case then I can report Escape from Planet Earth, which we watched this Good Friday, proved pleasantly good. That is, it was made to the exact same formula we've grown so tired of, the good old Pixar imitation; yet it packs enough punch to make it a cut above the rest. The story follows two alien brothers. One of them is the heroic one that does foolishly brave things all the time (like baby rescue missions on dangerous remote planets). As a result, he gains the public's admiration. The other is the one behind the scenes that actually saves the day, more or less. One day the brave brother is tasked to go to earth, where he is quickly captured by the forces of one General Shanker. And then it is up to the other brother to save the day! Only that things are not that simple: it turns out Shanker has a plan up his sleeve, a plan that in a very Old Man's War like manner involves humanity rising on top of all the alien species that currently hold superior status to earth's humanity. Why is it that I liked Escape from Planet Earth, then? I mean it's not like the plot sounds too revolutionary. Yet the film has a bit of an edge of it which I can perhaps explain through the presence of some names involved with the project. The cast features one Ricky Gervais while one Stephen Fry was involved in the writing, for a start. Then there is one William Shatner portraying the role of one evil general Shanker and doing a very good job indeed. It's not like the names are just there for star power: those names really give the movie an edge. Gervais and Fry, for example, are famous atheists. And that particular state of mind is evident in Escape from Planet Earth. Not that the movie discusses religion much, but that whole point of view of earth being just one of many planets and humanity not being anything special when compared to other members of the galaxy is closely related to the minds of people unbound by religion. I would also point out these are very Mass Effect like themes, too, and you know how much I fall for Mass Effect. 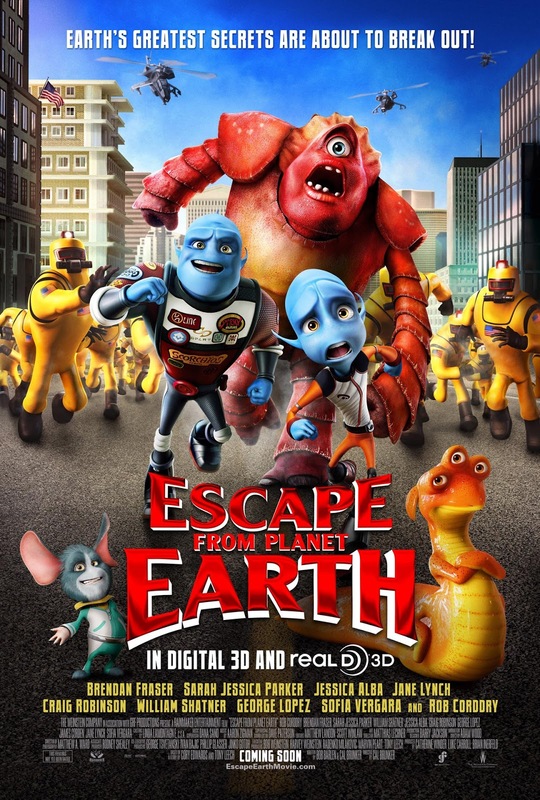 Overall: Sure, Escape from Planet Earth is one of many. It is not too bad, either. 3 out of 5 stars.